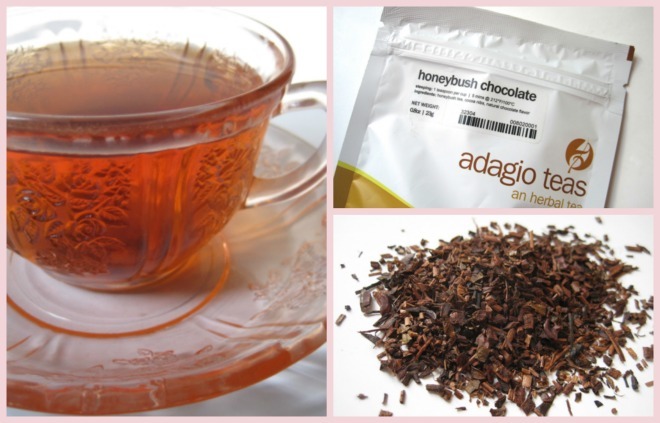 When I recently got to choose some sample teas from Adagio Teas, one of the ones I selected was this Honeybush Chocolate Herbal Tea. I'm trying to eat fewer sweets but still crave a sweet treat occasionally, so dessert-flavored teas are nice to have on hand! Honeybush is said to be a "sibling" of rooibos, and that smooth, sweet, and in this case, chocolatey taste was exactly what I'd hoped for. And because it's an herbal tea and completely caffeine tree, I feel good about drinking this tasty brew any time of the day or night! Go here if you'd like to learn more about this tea. 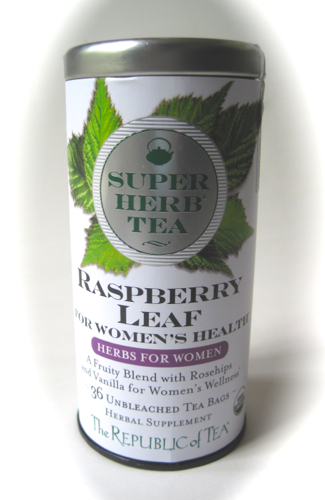 Raspberry teas can often be overly tart, but this one with raspberry leaf had a deliciously sweet taste that was a pleasant surprise. I imagine the sweetness is from the vanilla flavor, but whatever the case, this herbal tea is one I greatly enjoyed—even more than I had hoped! And I have to show you the packaging it came in. Recognize those tissue-like papers with holes in them? 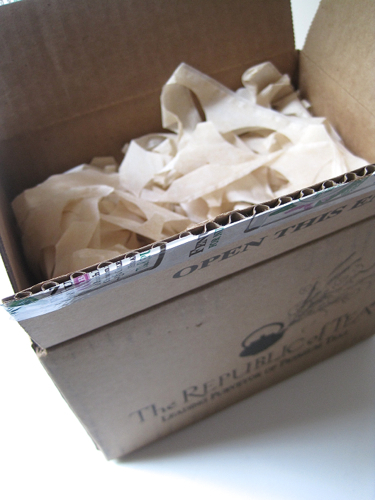 It's pretty clear that Republic of Tea is smart with their recycling, which is yet another thing to admire about this company! 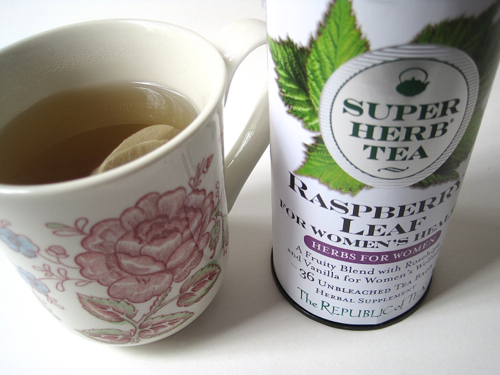 Learn more about their new SuperHerb teas by clicking here. 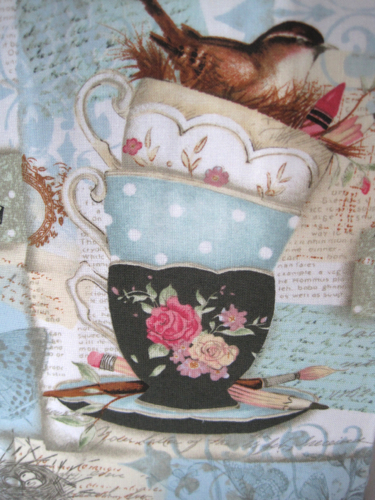 A beautiful gift … and a fabric that even Veruca Salt couldn't find! Recently I mentioned that I had received a lovely gift bag as a thank-you gift for being a judge for the hat contest at the Senoia Area Historical Society's spring tea. 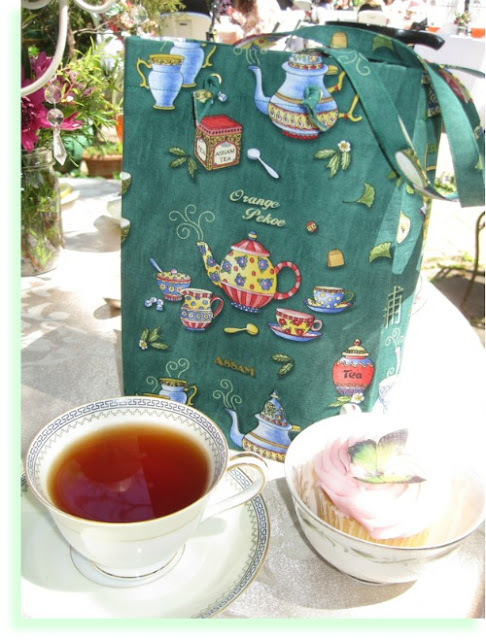 I got to select from three fabric gift bags, all with lovely tea-themed prints, and I immediately chose this one with the teacups, handwriting, and aqua blue fabric. It was calling my name! 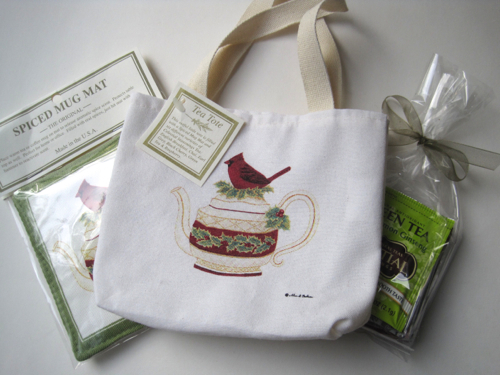 And a cute Christmas mini tea tote, teas and mug mat. I love these designs! But oh, this fabric! Here's the other side of the bag, and you'll note the vintage drawings of teacups at bottom right, one used as a pincushion and one with a little bird visiting. I'm keeping my fingers crossed that some overeager seamstress purchased an extra yard or two and will have it on eBay soon! 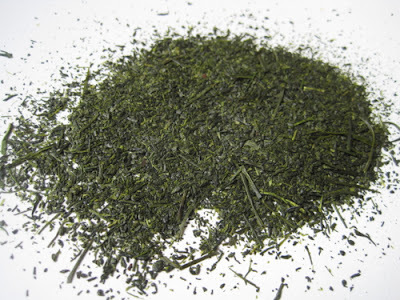 Some Japanese green teas fertilized with ... sugar cane! Earlier this year, the online book club I'm in read the book Queen Sugar by Natalie Baszile. I know that it's also a drama series, which I haven't watched, but I very much enjoyed the book that centered around a young woman who inherited a sugar cane farm in Louisiana. 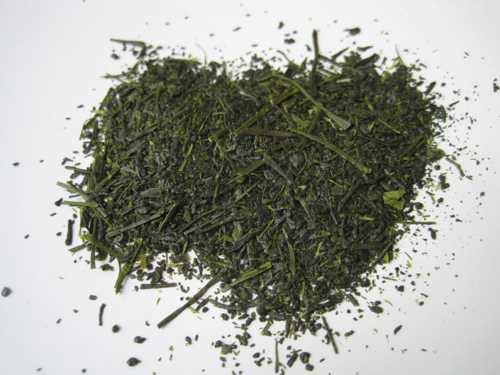 For that reason, I was particularly delighted when I heard from Kei Nishida of Japanese Green Tea In, a new company that imports some of the highest-grade green teas in Japan—teas that are grown using sugar cane as a fertilizer! This process is called the "Chagusaba Method," and I was naturally eager to try these teas, which soon arrived in some particularly lovely packaging. 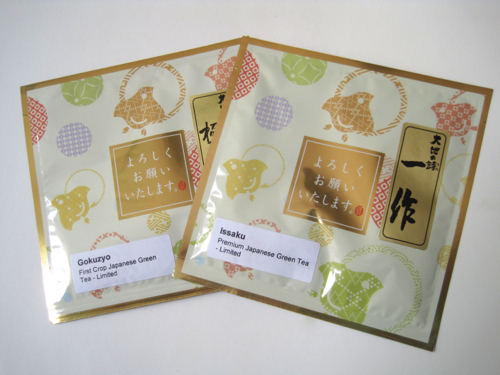 The first of the teas I tried was the Issaku Premium Japanese Green Tea. As soon as I opened the packet, I inhaled a whiff of what was clearly very fresh green tea. I used a filter bag to steep these bright green leaves, and the result was a super smooth tasting green with a very rich mouth feel. And rare for a green, I found no astringency in this tea. It was terrific! Next I tried the Gokuzyo First Crop Japanese Green Tea. This tea had a lighter, more subtle green tea taste, but as with the other tea, I was delighted by the fresh taste and absence of any astringency. 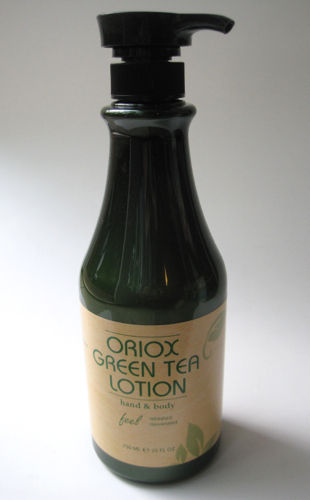 I think that lingering astringency you get with some greens is one of the reasons more people don't drink green tea, so this was a wonderful green and one I am quite happy to be able to recommend. And if, like me, you're intrigued by the idea of tea grown with sugar cane as a fertilizer, click here to learn more about this process! 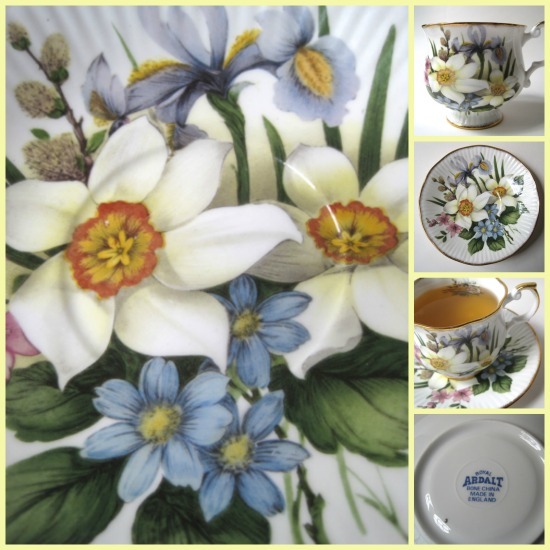 A Royal Ardalt cup and saucer perfect for spring! A few weeks ago, my sister and I had a yard sale together, and I'm so glad I went through her "junk" the night before. Unbeknownst to me, she had decided to downsize and get rid of some of the teacups that had belonged to her husband's grandmother. She offered me all of them I wanted, but I showed (for me) great restraint and was thrilled to take home only this one, which is by a maker whose name I don't ever recall hearing before, Royal Ardalt. 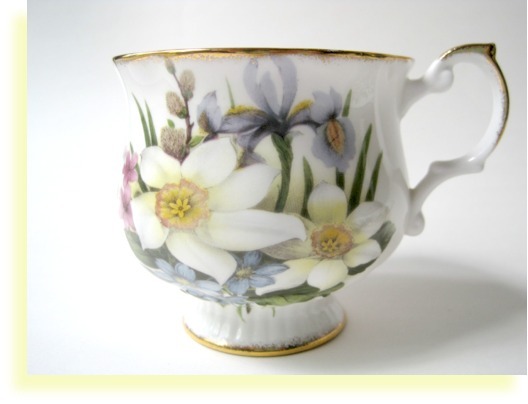 For years I've seen this shape of teacup in other collections, but I don't believe I've ever had one quite like this. I love the bulb-like shape of the cup. So soft and feminine! 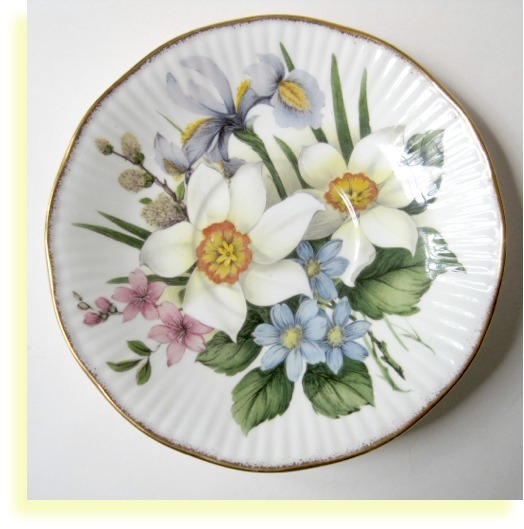 And I thought the saucer was especially pretty as well, making this the perfect set for springtime sipping. Have you all heard of Royal Ardalt? I thought I knew just about every name in teaware, but that was a new one to me! Janet P.! And Janet, I just sent you an email to confirm your address and will get this in the mail to you shortly. Congrats! In this, her eighteenth tea shop mystery, writer Laura Childs takes a bit of a different turn. I found the characters and the plot both a little edgier this time, and this may be one of my favorite tea shop books of recent years. The story begins with Theodosia and Drayton attending a type of tea I initially thought might be rather off-putting: a rat tea. Instead, I found myself thoroughly intrigued. As Drayton explains it to Theo, "Seventy-five years ago, rat teas were all the rage in Charleston. You see, at the advent of World War Two, our fair city underwent a tremendous population explosion as war workers arrived at the navy shipyard in droves." Drayton goes on to tell her that this growth resulted in super busy downtown merchants, who tossed their trash on the sidewalks, drawing rats. Public health officials led a campaign to get rid of the rats, and society ladies even had "rat teas" to help promote the effort. So Theo and Drayton are guests at a modern-day rat tea complete with wait staff in rat costumes. Alas, the tea hostess's husband meets his ghastly demise at the tea, and so our story begins. If you've read the tea shop mysteries all along, as many of us have, you've probably noticed by now that Theodosia's personality has shifted and changed over the years. It's a transformation I have particularly enjoyed watching. Today's Theo is stronger and more self-assured than the early Theo, and her skills as both a businesswoman and an amateur sleuth seem to have grown by leaps and bounds. There's a possible new romantic interest for our heroine as well, and I will keep my fingers crossed that Theo finally gets a steady gentleman caller in the next book. One of our regular players is out of town and thus absent from the tale (no spoilers since some of you may not have read this book yet), and I was surprised to find how much I missed this character. 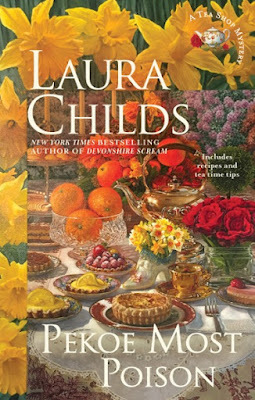 My only complaint about the tea shop mysteries is that they don't arrive nearly as frequently as I would like, but considering that Laura Childs (aka Gerry Schmitt) has three other series going as well, I guess I can't complain. 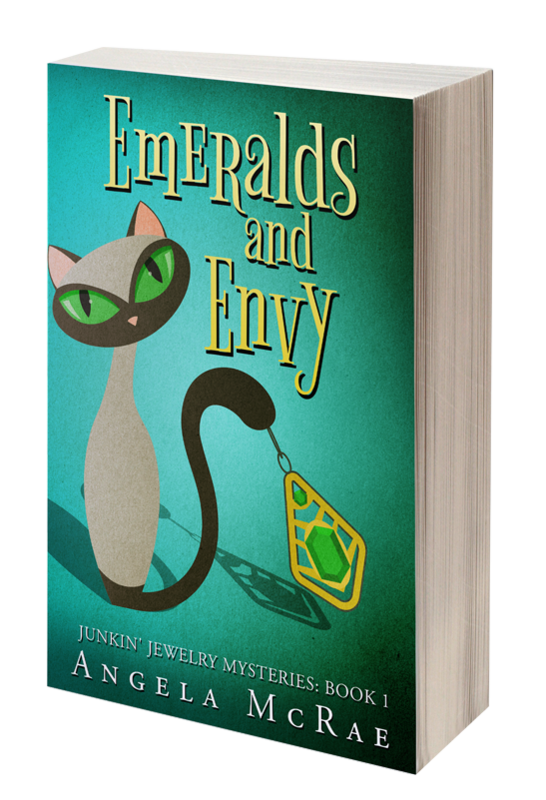 And to satisfy my thirst for more of her books, I have just added two more of her other cozy mysteries to my reading queue. If you have read Pekoe Most Poison, I'd love to hear whether you enjoyed the book as much as I did! Did you find it a little different from the others? 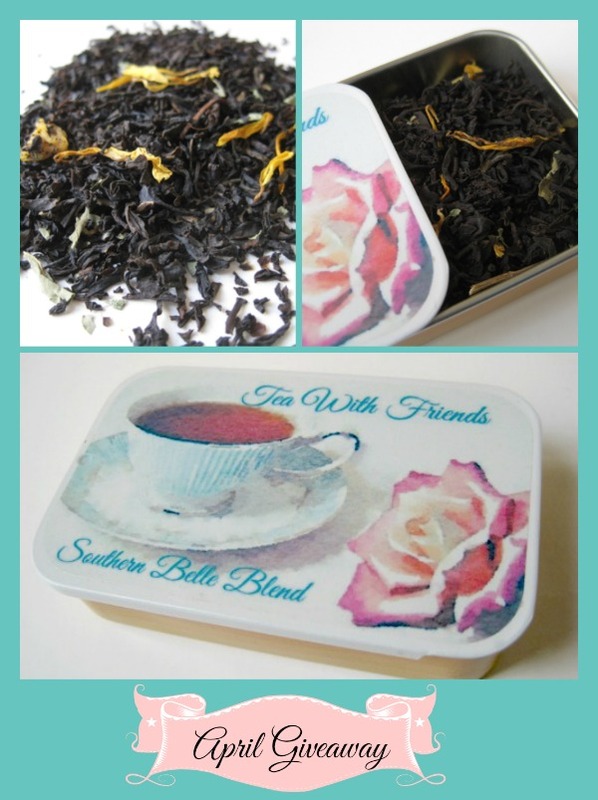 April Giveaway: Tea With Friends Southern Belle Blend Tea! 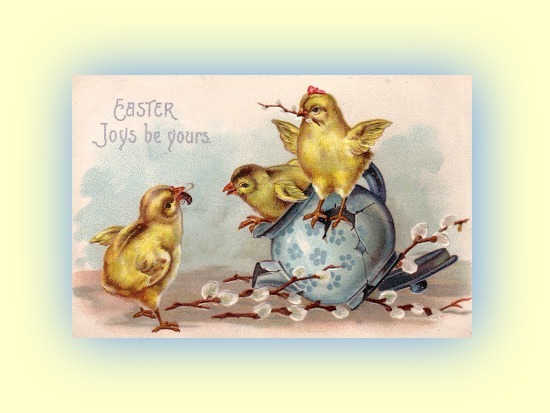 Friends, I am so excited about this month's giveaway because it was so much fun to create! 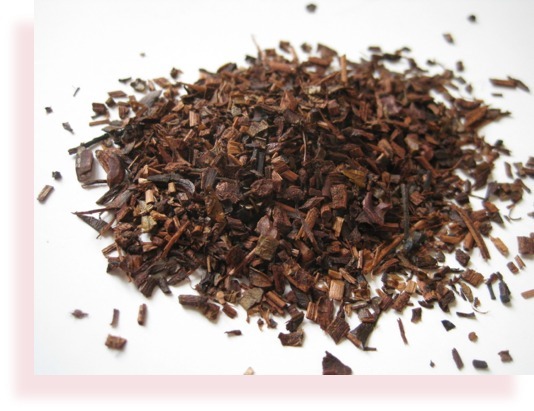 When Adagio Teas recently offered me the opportunity to try some of its teas for review, I decided to try my hand at something that I had toyed with but never done on their site before: creating my own blend. I mixed and matched teas, uploaded a variation of my blog header to go on the small tin (super easy), and within days, I was enjoying my own exclusive tea blend. THIS WAS SO MUCH FUN! (To create your own blend, go here and dive right in! Wouldn't these make great favors for a tea party? 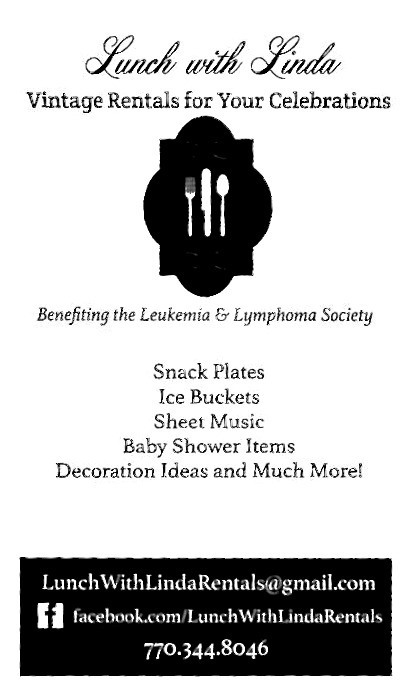 They're $5 each but half off if you order 10 or more, which makes them quite affordable for favors.) 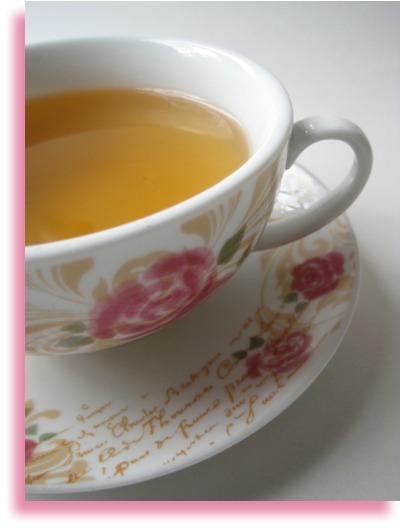 I've enjoyed my own sample of the "Tea With Friends Southern Belle Blend," and since I ordered two of the tins, I'd love to get some feedback on the tea from one of you! My blend was inspired by a certain Southern heroine who hailed from a place known as the Peach State, so of course my blend is heavy on the peaches, and I added a touch of cream as well. 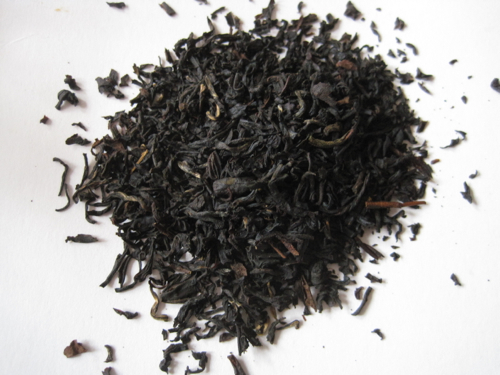 There's a bit of Assam tea that has just a hint of molasses, and finally the tea is embellished with lemon verbena, an herb associated with my Southern heroine's mother. If this doesn't leave you saying "Fiddle-dee-dee. Who cares?" then I'd love for you to be my guinea pig! If you'd like to win this sample tin of tea, just leave an "Enter me" to this post between now and 7 a.m. Monday, April 17, and you'll be entered to win. (US and Canada residents only, please.) Good luck! 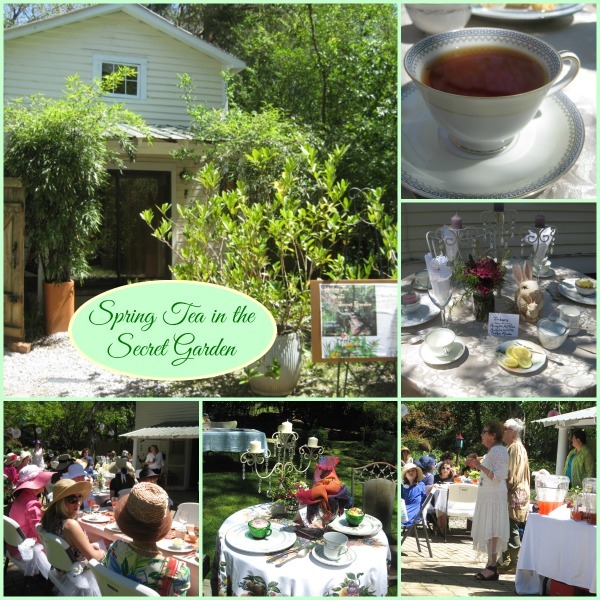 A perfect afternoon of Spring Tea in the Secret Garden! A soft breeze, warm sunshine, the happy sounds of of tea being poured into glasses and teacups, and the lively chatter of dozens of women. 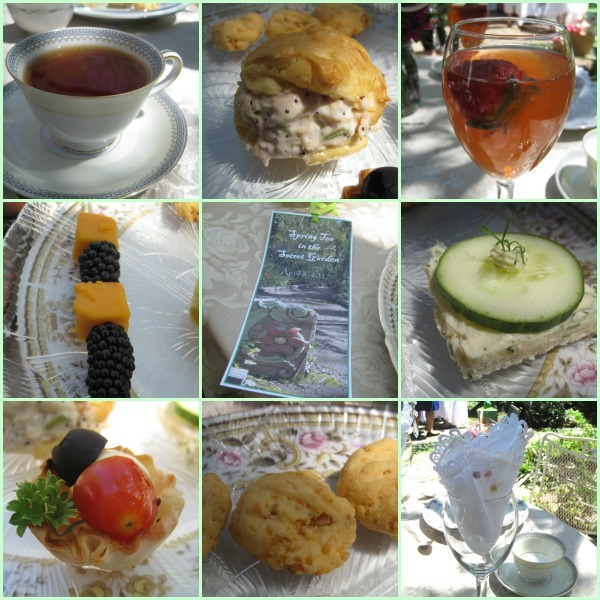 These were my sensory experiences on Saturday when the volunteers in Senoia once again combined their considerable talents to host a tea benefiting the Senoia Area Historical Society. 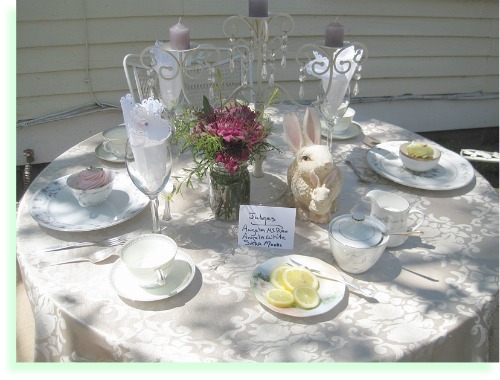 This one had the delightful theme of "Spring Tea in the Secret Garden," and oh, how I wish you all could have been there! 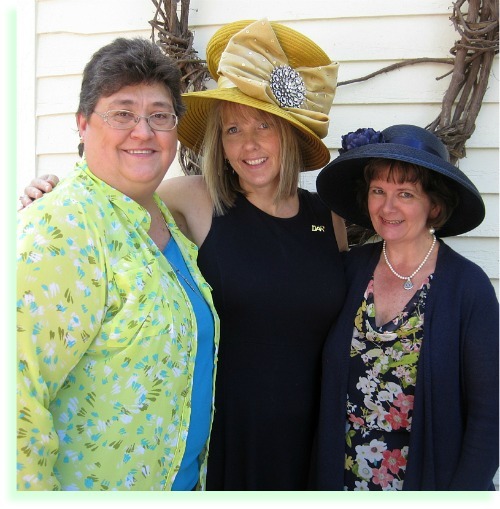 I was again asked to serve as a judge for the hat contest, and I eagerly said yes, knowing that tea with the SAHS folks is always a treat. A friend of mine who saw some of my photos on Facebook expressed amazement that they offer a plated tea for so many guests, but I've simply come to expect this from the hardworking volunteers in Senoia! In addition to Vanilla Caramel Hot Tea and an Iced Watermelon/Strawberry Green Tea (I had to try both), we enjoyed Chicken Salad en Croute, a Fruit Skewer, a Cucumber Sandwich, Grape Tomato, Cheese, Black Olive, and Parsley in a Filo Cup drizzled with Raspberry Vinaigrette, and Cheese Buttons. The first table I noticed when I stepped inside the gardens was this one, and oh, how happy I was to realize this was the judges' table! 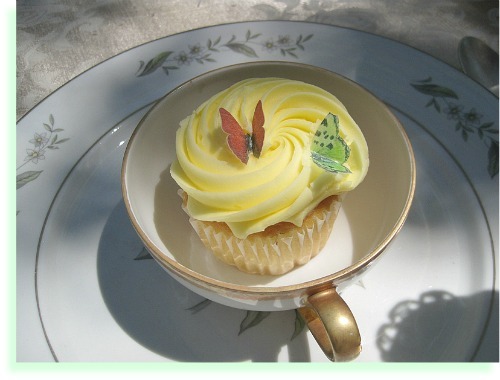 At each place setting was a charming iced cupcake with edible butterflies! Homeowner Pat Thompson is the one who graciously opened her gardens to us all. In talking with Pat later, I learned that she did most of this work herself, hiring out only a few things like the bricklaying in the patio area where we sat. 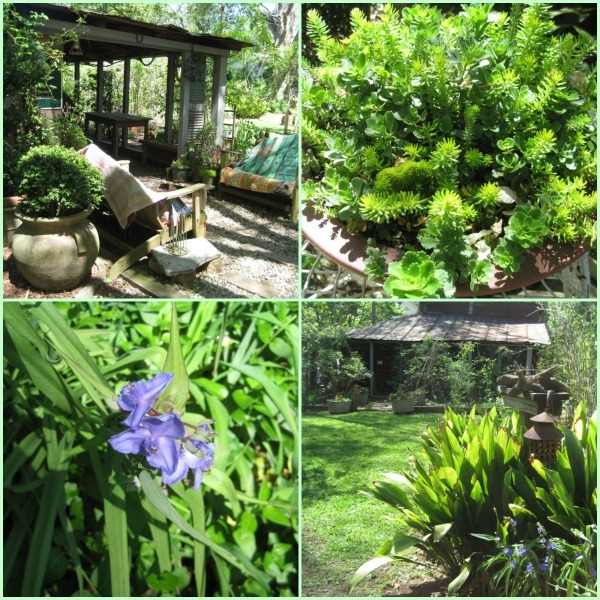 I'd love to have a garden like this but don't want to do that much work, and I haven't yet found a solution to this particular dilemma! My fellow judges were Angela White, who is well known locally for her work with our county in planning and tourism (she also happens to be in my Sunday School class) and someone I met just last week, Sara Moore, who now works at the newspaper where I used to work. 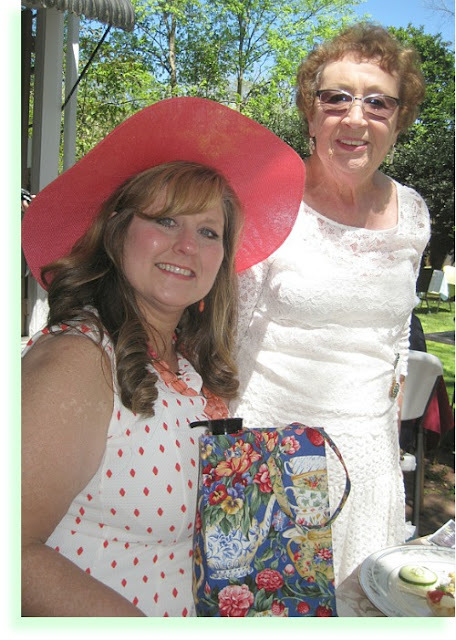 Here's sweet Sara, at left, with Nancy Roy, the tireless organizer of the tea and the dear friend who so kindly invited me. I had a great time chatting with my fellow judges, and we oohed and aahed over all the pretty hats as well as our food. I had skipped lunch and was glad I did when I saw the dessert offerings! 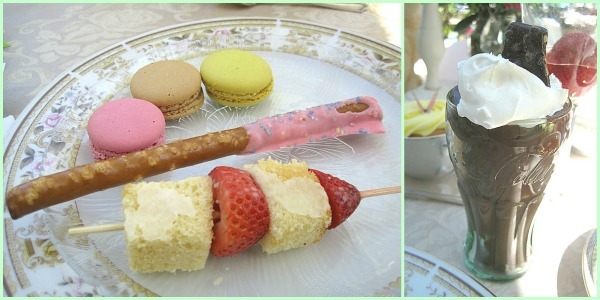 I loved coming home with the clever idea of the pound cake and strawberry skewers and frosted pretzels, and of course macarons are always a favorite sweet for me. (Now that I've had the pleasure of sampling macarons at Ladurée in Paris, I appreciate getting a good macaron here at home!) And if all that weren't enough, we also enjoyed a decadent chocolate pudding with whipped cream and an embellishment of chocolate, served in a perfectly Southern touch of a mini Coca-Cola glass. Loved it! The organizers even had commissioned handmade fabric gift bags of tea goodies for each of the judges, and I got to choose first. Regular readers will not be surprised to hear that I chose the aqua-colored one (which I 'll show you soon), and all three of us were tickled with our gifts. You can see Sara's pretty bag in the photo with her above, and this is Angela White's. 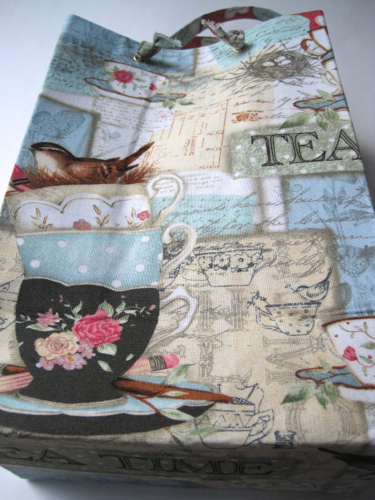 I loved all these great tea fabrics! And just for fun, I asked Sara to take a picture of Angela White, at left, and myself with another Angela, Angela Munson, who was the Overall Winner of the hat contest. I can tell you on good authority that Angela, Angela, and Angela—among many others—all had a great time! This week I sampled two new teas from Arbor Teas, the organic tea company that recently sent me some samples of their teas. The two I tried this week were the Earl Grey black tea blend and the Five Peaks Green Dew, a green tea. When I opened the packet of Five Peaks Green Dew green tea, I thought the tea had a very vegetal scent. Steeped, the tea's scent reminded me of roasted asparagus. 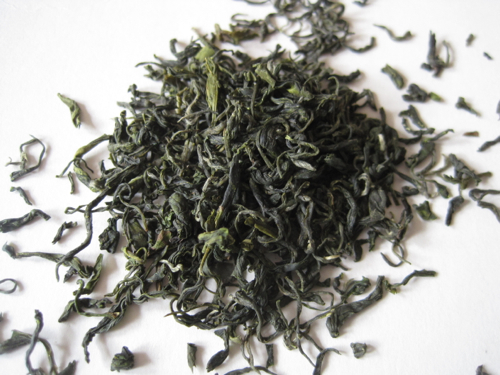 It had a rich and satisfying green tea taste, with very little astringency. 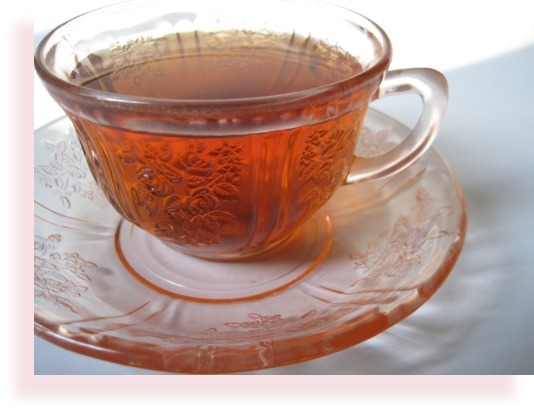 Do you like organic teas? Or drink only organic teas? 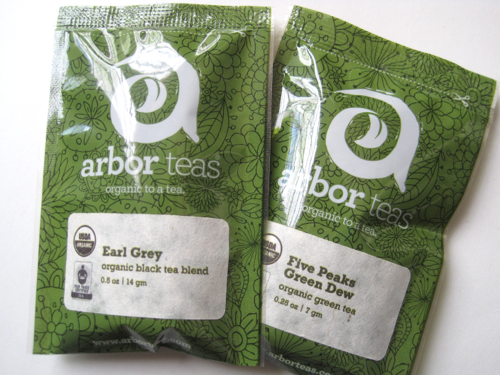 While I do drink teas that aren't labeled organic, I must say that I enjoy seeing that word "organic" on a tea label, and I'm delighted to have discovered some delicious new teas from Arbor Teas. 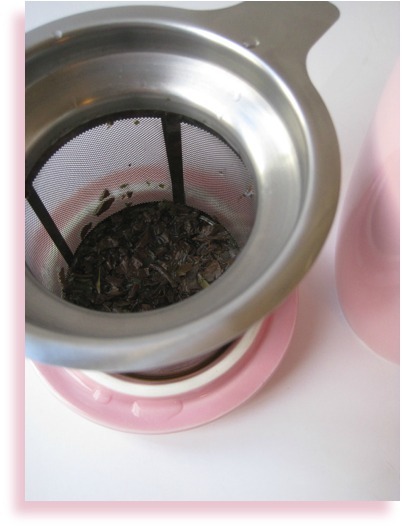 A pretty-in-pink tea mug with an infuser basket that's great! 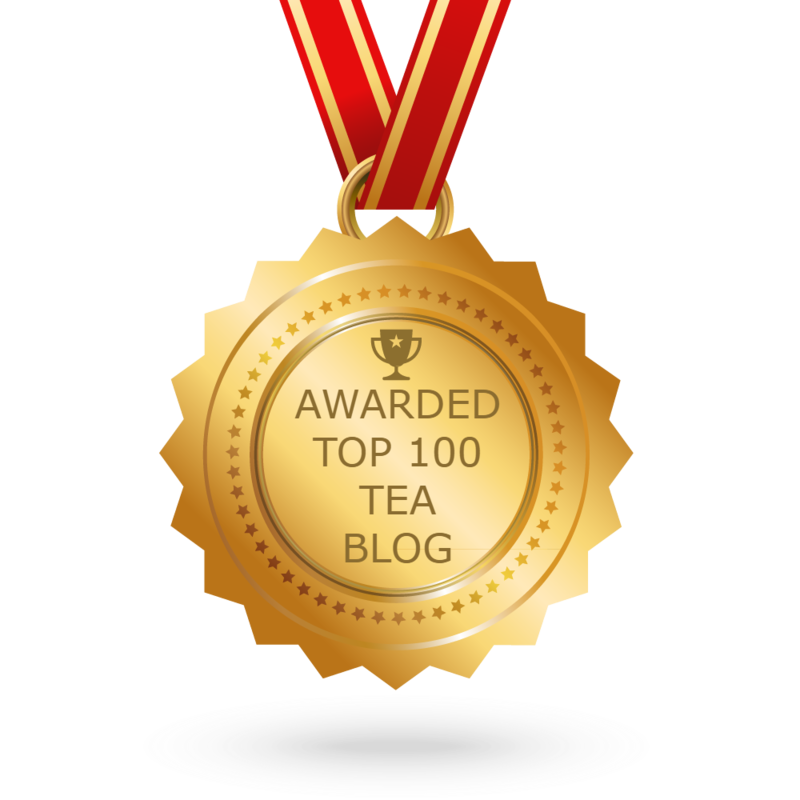 I was recently offered the opportunity to review some products for Adagio Teas, so I truly felt like the proverbial kid in the candy shop as I made my selections. 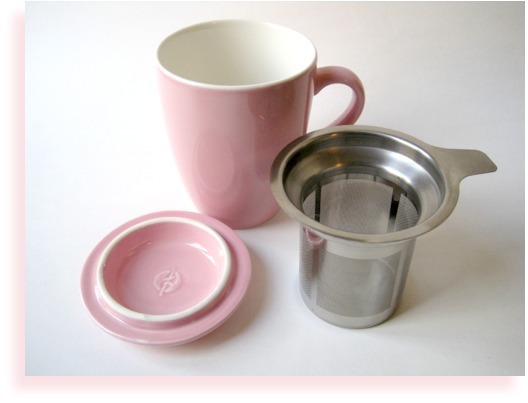 One thing I had wanted to try but absolutely did not technically need was this: their Pink Porcelain Cup and Infuser. Clearly I am not hurting for teawares, but when I'd visited the Adagio website, I couldn't help wondering whether this infuser basket would work or not, as I've had plenty of unfortunate experience purchasing tea mugs with infusers that weren't very good at keeping tea particles out of my tea. For that reason, I was a little skeptical. But since I got to order this one for free, I figured I had nothing to lose. 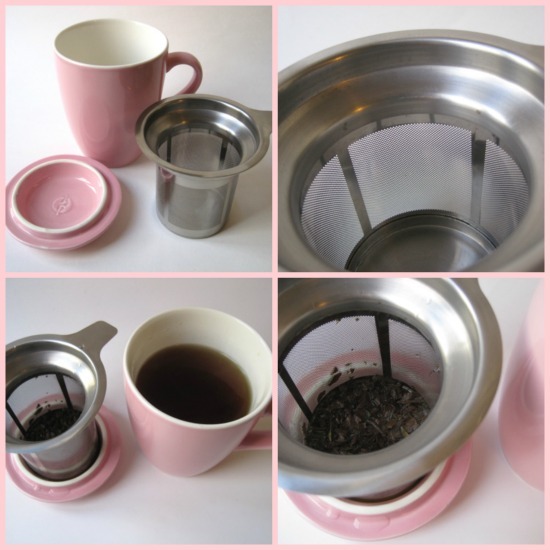 When my package arrived, it dawned on me for the first time that the lid really would help keep the tea hot while it steeped, and I was surprised by a) how very sturdy the stainless steel basket was and b) how fine the holes of the infuser basket were. I was suddenly quite hopeful! And reader, I am happy to report that the the infuser basket in this mug does a terrific job of straining off the tea leaves. You will note that the lid also serves as a coaster, so maybe I can stop staining the berry bowls I usually let fill in for coasters as I steep my tea. And I don't want to tell you what fun new tea I was drinking just yet (I ordered some for a giveaway next week, so stay tuned! 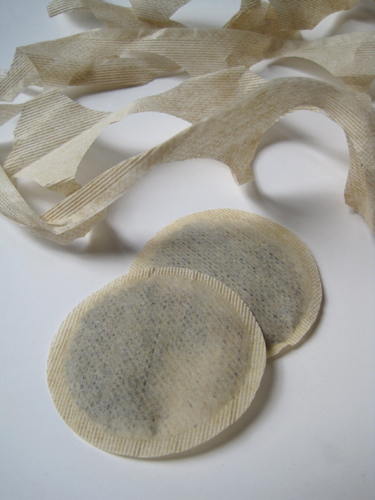 ), but I will say that even the smallest particles of tea were strained off. I was impressed, and I'm thankful to Adagio for letting me try a reasonably priced infuser mug that actually works. You can check it out here in pink and here in other colors as well! 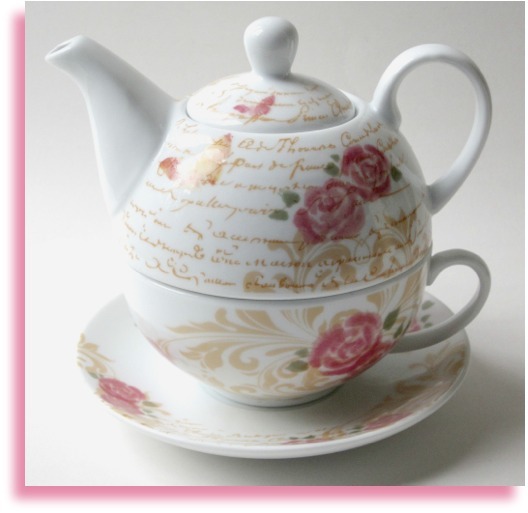 Ding-dong, it's Avon calling … with a charming new teapot! A few weeks ago, my friend and former coworker Beverly got in touch to let me know that she was selling Avon again and that they were coming out with a teapot that she had a feeling I might want. Now I was an Avon lady myself back in college and have remained a fan of their products, so I was quite happy when Beverly contacted me. When she showed me a photo of this tea-for-one set and I saw the *handwriting* on it, I knew I had to have it for the office where I do my writing! This is my new go-to teapot and teacup in my office, and I absolutely love it! Isn't this design beautiful? 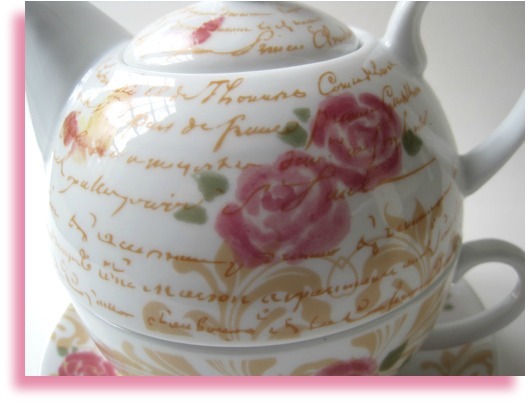 The catalog description notes that it is "decorated with a vintage Parisian illustration," and it makes me so happy to have teawares with writing on them at my side as I finish up the edits of my novel! Will it help my writing and editing? Only time will tell, but I am delighted to have this set! 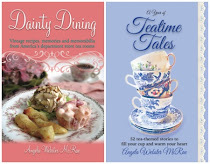 There are also some other great new tea-themed pieces in the Avon Living catalog, and Beverly said that yes, I could share a link to her Avon website here in case, like me, some of you have been without an Avon lady for a while. (She and husband David run their business together, and she laughingly informed me he is "an Avon guy" instead of an Avon lady.) 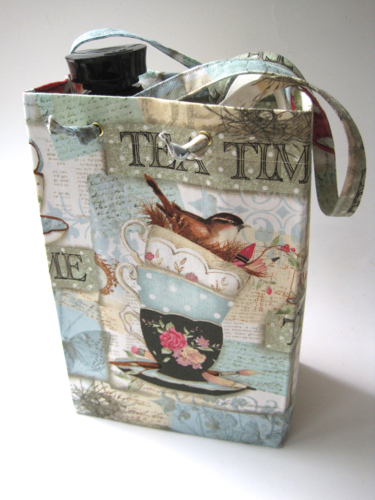 Here's the link to the tea set, and here's a link to the brochure with other tea goodies. Do you have an Avon lady where you live? And if so, do you have a favorite product? Mine, by far, is their makeup remover lotion, which I guess I've been using for more than 20 years now. It takes off even the most waterproof mascara without taking off eyelashes in the process, and once I discovered it, I never used anything else!